One of the main treatments prescribed for eczema in children has proven to be ineffective as treatment of the condition, a study has found. Emollient bath additives are estimated to make up as much as a third of the cost of treating the condition in the UK and the NHS pays more than £23 million a year prescribing them to sufferers of eczema, according to a report published in the BMJ. But researchers found "no evidence of clinical benefit" when they were used in addition to standard care for the condition. The common skin problem is often treated by emollients, which come in the form of leave-on products such as creams, soap substitutes and bath additives. 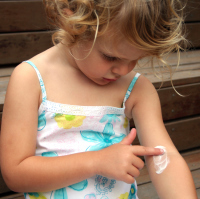 A team of UK researchers, from the University of Southampton, carried out a trial on 482 children aged between one and 11 who mostly suffered from moderate eczema. They were split into two groups, one of which used the bath additives in conjunction with the other treatment types over a 16-week period, while the other did not. No statistically significant difference in eczema control was noticed between the two groups, the report said. The scale used to judge this is the the patient-oriented eczema measure (Poem). It found the bath additive group scored 7.5, ranking "moderate", while the other group also had a "moderate" 8.4 rating. Once other contributing factors to the gap were removed during analysis, it was found the group which did not use bath additives was 0.41 points higher on the Poem scale than the other. The benchmark necessary to consider this a significant difference is 3 points. 0.41 fell far short of the benchmark. There was likewise no difference between the group for additional measures such a seczema severity over a year and cost effectiveness, the authors found. The report said it could not rule out the possibility that bath additives could offer small benefits to children bathing more than five times a week or among children under five. It concluded: "This trial found no evidence of clinical benefit from including emollient bath additives in the standard management of eczema in children. "Further research is needed into optimal regimens for leave-on emollient and soap substitutes." Before heading away on your next family holiday,make sure to get the insurance your family needs.